A second-hand clothing market in Nairobi, Kenya. Image by Colin Crowley via Flickr. Fast fashion, the modern phenomenon in which consumers buy cheap clothes and quickly discard them for new and equally cheap threads, is the heart of a retail boom in the developed world. But it’s also an ecologically disastrous exercise in unbridled consumerism. Every year, Western consumers cast off millions of tons of old, increasingly non-biodegradable clothing, much of which just piles up in landfills across the world. As long as wealthy countries are pumping out an unending stream of trendy t-shirts and polyester cardigans, it may seem logical to encourage people to donate their old clothes to nonprofits, or at least industrial recyclers that would keep these textiles out of the waste stream. But chances are even charitably donated clothes aren’t actually going directly to needy people, or even to thrift stores in the countries where donations are made. By some estimates, over 70 percent of all charitably donated clothing in the West is actually sold onto a global wholesale market. It’s then purchased by traders and resold to some of the poorest consumers in the developing world in what amounts to a nearly $4 billion-a-year industry. This reality may be surprising to those who’ve long thought they were doing something good by donating last year’s fashions. But the market for these garments is a downright conundrum for leaders in the developing nations, where most of these secondhand clothes are sold. Secondhand clothes are often the only affordable option for these countries’ poorest citizens, but regional leaders claim the used textile flow disrupts their own economies, degrades local pride by essentially forcing the majority of East Africans to wear (and be aware that they are wearing) cast offs, and causes their communities to shoulder richer nations’ pollution burden—once they’re worn out in resale markets, there’s not much to do but toss these duds into local trash heaps. 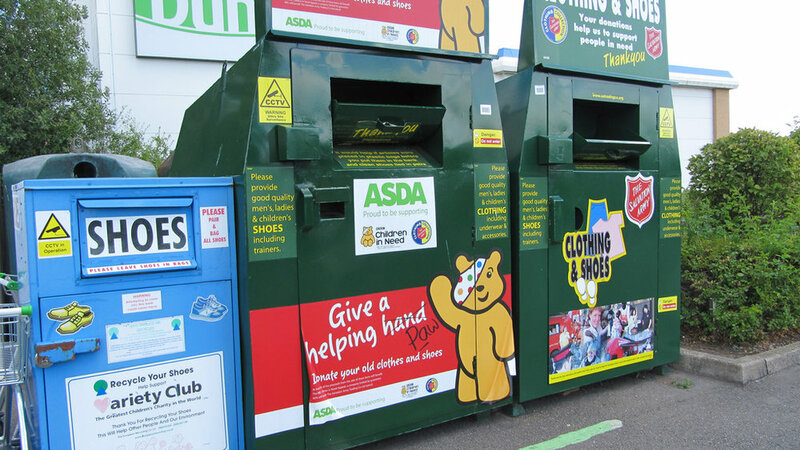 Bins for clothing donation in the United Kingdom. Even if sales benefit charities, most collected clothing will be sold overseas. Image by Howard Lake via Flickr. Last February, the East African Community (EAC), a bloc composed of Burundi, Kenya, South Sudan, Rwanda, Tanzania, and Uganda, decided to take action, agreeing to a plan to eventually ban the import of used attire outright. The EAC countries currently consume hundreds of millions of dollars’ worth of castoff clothing every year. In Rwanda, both the lower and middle classes commonly wear used, imported garments, while in Uganda, they make up 81 percent of all clothing. The EAC bloc has been angling to revive its apparel industry for years. But the constant flood of cheap, imported textiles into the region has, its leaders argue, made it hard to build local markets for domestically made clothes. In response, EAC countries plan to slowly raise taxes on second-hand imports while supporting regional textile and leather businesses with subsidies and government contracts. In the long term, the thinking goes, consumers can be weaned off these imports as the wider economic benefits of local business growth accrue. Earlier this year, the bloc pulled the trigger on the plan. By spring, Kenya, Tanzania, and Uganda had all initiated a consensus-suggested tariff boost on secondhand clothes from $0.20 per kilo to $0.40, with the intent to gradually increase that rate over several years. Rwanda went even further, going from $0.20 to $2.50 per kilo and instituting a number of pro-domestic apparel policies. This bold step could theoretically light a way for other African nations considering bans, like Malawi and Zimbabwe. Ban supporters point to East Africa’s historically strong clothing industry. In the 1970s, the sector employed 500,000 in Kenya alone. Subsequent trade reforms, pushed by international lenders and reluctantly accepted by struggling African nations, ended industry protections and opened the EAC region to secondhand clothes, collapsing the local apparel industry. As of 2016, domestic textile work employed only 20,000 Kenyans. Analysts have directly blamed used clothing imports for up to 40 percent of the region’s decline in clothing production and 50 percent of its decline in clothing industry employment between 1981 and 2000. But these arguments didn’t resonate with America’s Secondary Materials and Recycled Textiles Association (SMART), an industry group representing the nation’s substantial used clothing export sector. This spring, SMART complained to the U.S. government that the East African countries’ plan violated the 2000 African Growth and Opportunities Act (AGOA), a trade deal in effect until 2025 that provides African nations duty-free access to American markets, providing that they meet certain human rights, political, and free trade expectations. Over the summer, the United States Trade Representative’s office took up SMART’s case. SMART may be making a big deal about this proposed ban, but while secondhand attire is a huge part of life in East Africa, the EAC is not even a vital market for American used clothing exporters. The bloc represented just eight percent of the global used clothing market in 2013, and the US was only its fourth largest exporter worldwide. Most castoff American fashions go to regions like Latin America. But it seems as if SMART wants to draw a line in the sand against any possible affront to its interests, anywhere. And under President Donald Trump’s “America First” administration, SMART’s argument that the ban would cost about 24,000 American jobs will likely lead to a Trade Representative’s office ruling in its favor, a decision that could get ban-enforcing countries dropped from the AGOA trade deal. A secondhand clothing salesman at a market in Nairobi, Kenya. Image by Colin Crowley via Flickr. “As Kenya is the most significant player in the EAC, SMART is cautiously optimistic that Kenya’s precedent will give pause to other EAC nations considering moving forward” with their bans, writes SMART representative Andrea Lynn in an email. Even if SMART hadn’t decided to take a stand, or if the three remaining ban countries stay stalwart against America’s trade threats, the EAC’s action is already faltering due to a host of external and internal pressures that threaten to sink the plan in its early stages. In Kenya alone, about 65,000 people work as secondhand clothing traders and retailers, often earning relatively strong incomes—not to mention all of the tailors and designers who work with other countries’ hand-me-downs as base materials for local styles and new clothing items. In protesting the ban, the local secondhand industry has pointed out that their wares are still often of higher quality than many local clothes, but sell for just five to ten percent of new clothing’s cost. They argue that this is all most consumers can afford, even if domestic apparel was significantly subsidized. Hansen, along with a number of other analysts, says even with an official ban, continued demand for old clothes will still pull these products across porous borders; she’s seen that play out, via workarounds and outright smuggling, in nations with bans in place like Nigeria and South Africa. Bans on other products in the EAC, like plastic bags, have been undercut by similar smuggling. So not only could illicit secondhand clothes continue to thwart efforts to build domestic industry, but EAC governments would also be giving up existing tariff revenue on these imports once a total ban was in place. On top of that, even if these nations could somehow totally stop used garments from coming in, other factors would still stand in the way of a local clothing industry revival. Any domestically produced clothing will face competition from reliably cheaper new clothes from East and Southeast Asia. Apparel manufacturing would also likely be subject to infrastructure and energy needs hamstringing other industries in the region. And in nations like Rwanda, where there never was much clothing manufacturing, a total lack of capacity may lead to reliance on outside expertise—especially from Chinese entrepreneurs, who are increasingly interested in doing business in Africa as labor costs rise at home. A sorting facility in New Jersey separates and packs clothing, most of which will be exported to countries around the world. Image courtesy of textile recycler Wearable Collections. If EAC nations and similar countries are serious about getting their clothing industries back up and running, they’ll need to make far bolder—and costlier—plans than the tax-and-ban program currently on the table. As just one example, they’d need grand-scale infrastructure projects to make it easier and cheaper for local businesspeople to run factories. They’ll also need to go after hearts and minds, creating hype and demand for domestic styles. Unfortunately, while nations importing second hand clothes can take steps to revive their industrial bases, they can’t do much to control the flow of cheap used clothing around the world. That’d require us in the developed world to put the brakes on fast fashion—right now our massive supply of unfashionable castoffs demands a market. The EAC’s ban is a tiny dam in an endless stream of garbage clothing. But it’s a notable stand, and maybe the only move available to nations that feel they must act against the economic pressure of unwanted imports that devalue their own markets. Ultimately though, as consumers in the developed world, we are also responsible for understanding and owning our role in global markets—and the far-reaching effects our impulse purchases and shopping binges can have on people across the globe.